Each wedding anniversary my wife and I seek out a fine dining restaurant in which to celebrate. And even though we are both capable of throwing together some decent scran at home and swigging a fine bottle of wine with gusto, the differences between that and dining in a Michelin-starred restaurant are considerable, to say the least. For a start, we have to do the whole thing ourselves, set against the fact that there is something rather appealing by having everything done for us, once in a while. The art of fine dining lies not solely in the food but in the theatre. And like all theatrical performances, there is a process to follow: the journey, the anticipation, the assessment of the repertoire, the performance and the appraisal. 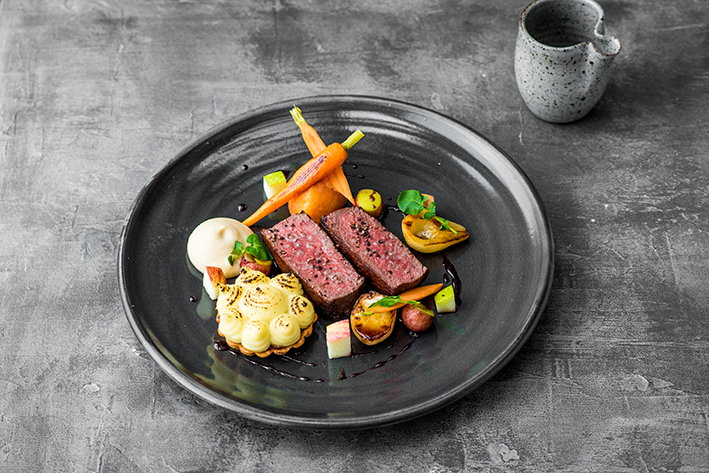 That scenario can, of course, apply to any dining experience, but in a fine dining setting, especially so in a restaurant like The Kitchin in Leith, near Edinburgh, it is imbued with a quality of expectation not normally found in a pizza parlour or burger bar. Season the experience with the knowledge that said restaurant is piloted by renowned chef Tom Kitchin, and an added dimension comes into play. You know things are going to be good. 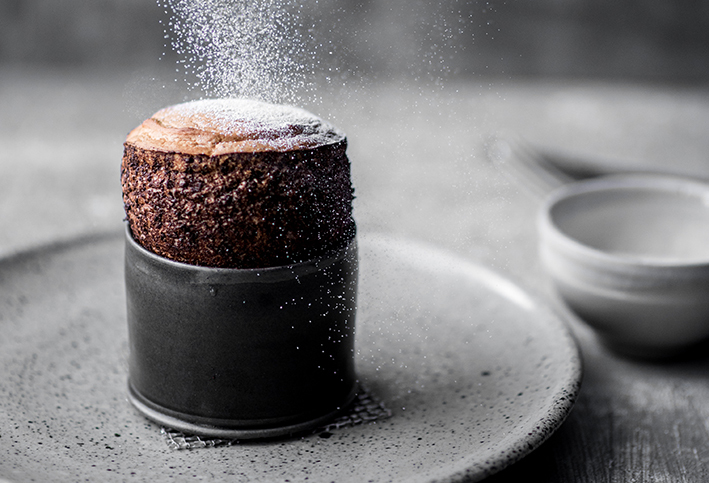 Set in a converted whisky bonded warehouse in the docklands of Leith, the eponymous Kitchin combines British seasonal cuisine with the techniques of French cooking. 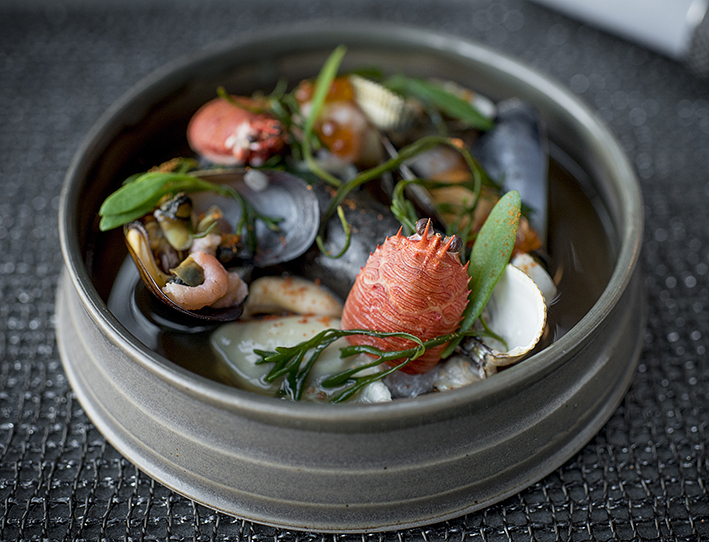 The underlying philosophy is not just about good food, but about bringing Nature to the dinner plate, reflecting the chef’s passion for the finest Scottish seasonal produce. When you arrive, you receive a small rolled-up map showing exactly where the restaurant’s ingredients are sourced. It’s a curious thing that I can’t fully explain, but knowing where an ingredient comes from sounds a note of authenticity. Would it matter if the oysters were from Loch Fyne (as they are) or the Isle of Mull? 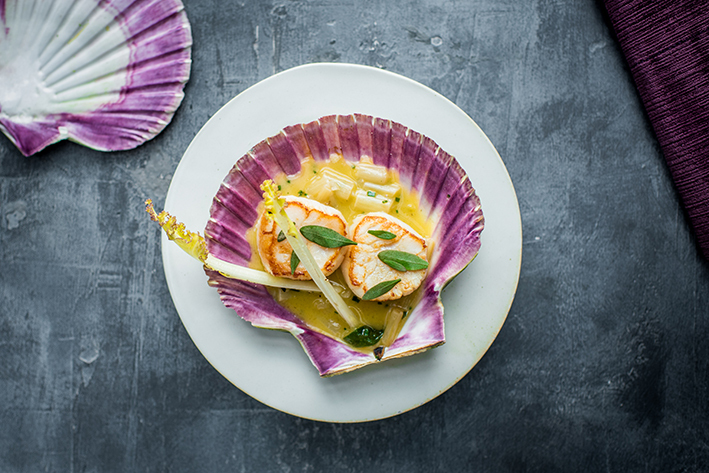 Or the scallops, hand-dived from Orkney rather than Shetland? Probably not, but it’s good to know. The dining room is a pleasant surprise, cosy and intimate in subdued grey and silver tones that lead the eye to the bright, glass-fronted kitchen wherein the ‘orchestra’ is at work. It’s a very relaxed atmosphere, populated by an efficient and knowledgeable team who float effortlessly and unobtrusively around the tables. Once my wife spotted the boned and rolled pig’s head with roasted tail of langoustine from Tobermory there was no stopping her. I’m a sucker for scallops, and the fact that we were on our way home from Orkney meant that we managed to prolong our love affair with those islands for a while longer. Three fish currently appear on the menu: Scrabster monkfish, North Sea halibut and hake over which the kitchen brigade weave a kind of magic. They are backed up by stuffed saddle of rabbit, roasted loin and braised haunch of Borders roe deer and Highland wagyu beef. In season, expect to find lobster and mussels, too. Nor are vegetarians overlooked. The restaurant offers a lunchtime menu that embraces pumpkin risotto, artichoke millefeuille with black olives or a wild mushroom ragout. Tasting menus are also available, all of which are something of a surprise in one way or another. They come with the option of wine pairing, a great idea if you are staying close by, and a quick way to becoming warmly woozy in the brain department. Of course It came as no surprise that the wine list ran to 28 pages, but sensibly with as many as 17 white wines, 1 rosé and 18 red wines available by the glass. It was good to see wines from Portugal, often neglected (unreasonably, in my opinion) by many restaurants, along with wines from lesser-known countries like Hungary, Greece, Slovenia, Armenia, Lebanon and Morocco. Of course, all the greats are there: you can get a 1995 Chateau Petrus for £3,800 or a Montrachet Grand Cru for £1,300, if you are that way inclined. But, having acknowledged what was beyond my financial reach, I homed in on a most satisfying Pouilly-Fumé ‘Eurythmie’ from the domain of Jonathan Didier Pabiot, a vineyard I’d discovered during one of my many France travels. It was an agreeable compromise, something that worked with all our dishes, although conventionally sized bottles do seem to evaporate rather speedily. As expected, the experience was a delight from beginning to end; well organised and thoughtful, down to the ‘Happy Anniversary’ card on our table. And that, we saw, as an invitation to return. Open: Tuesday to Saturday: 12.00pm – 2.30pm; 6.00pm to 10.00pm. Closed Sunday and Monday, and over the Christmas period and for a few days in October. 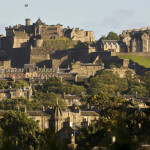 During these closures The Kitchin’s sister restaurant, Castle Terrace (also Michelin-starred) is open, other than over Christmas T: 0131 229 1222.